IFC has announced their events at SXSW 2010. This one looks like it will be really special. 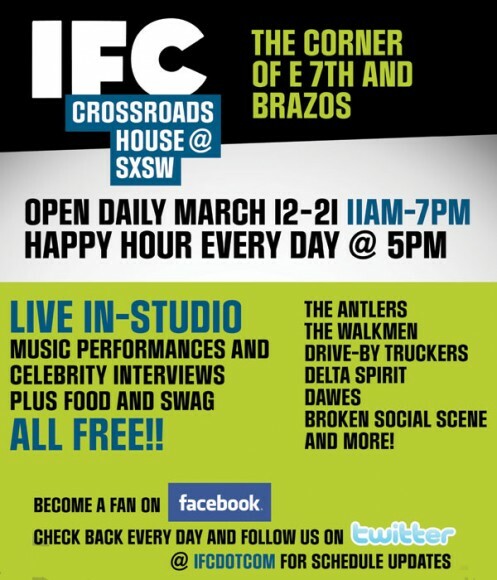 More than a party, IFC will have what they will call Crossroads House @ SXSW. In addition to stellar performances from the likes of Broken Social Scene, She & Him, The Black Angels, The Walkmen, Drive-By Truckers, Neon Indian and more, the house will also have free breakfast every morning at 11 a.m., a free all-day coffee bar, free happy hour every evening at 5 p.m., free wi-fi, cell phone and laptop charging stations and daily giveaways. Wow. Even by SXSW standards that’s nuts! The house will host interviews with film and music artists and The Hold Steady’s Craig Finn will be hosting the music portion. The only catch is, you must have a SXSW badge, wristband or screening ticket stub to get in. More details to be announced soon and we’ll update here once we have them. The house will be open daily March 12th – 21st and will be open from 11 a.m. – 7 p.m. Well done, IFC!